Compact mini stepper with built-in resistance for home and office use. Electronic LCD monitor tracks time, calories burned, count, strides every minute. Twist action moves up and down to help tone buttocks and thighs. Exercise bands for upper body workout: arms, chest, back, and shoulders. Sturdy steel construction provides years of reliable use; user weight capacity: 220lbs. Oversized slip-resistant footplates massages your feet and provides workout stability. Rubber feet caps protect the floor from being scratched. ✔ 【TRACK YOUR FITNESS】LCD monitor measures the steps, time, total and calories, making your exercise more reasonable and effective. ✔ 【HOME OR OFFICE USE】Compact mini stepper with built-in resistance for home and office use. ✔ 【WITH 2 BANDS】Exercise bands for upper body workout: arms, chest, back, and shoulders. Twist action moves up and down to help tone buttocks and thighs. 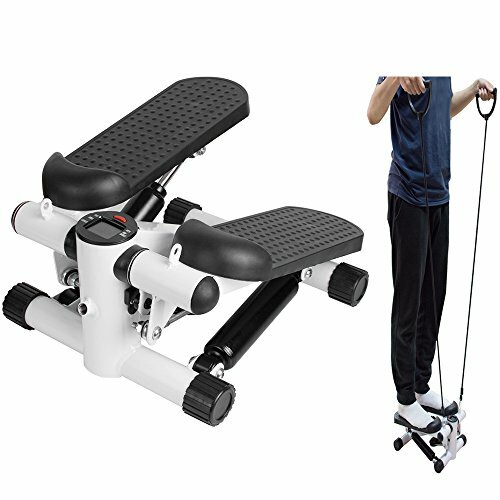 ✔ 【PREMIUM QUALITY】Oversized slip-resistant footplates massages your feet and provides workout stability. Rubber feet caps protect the floor from being scratched. ✔ 【SATISFACTION GUARANTEED】60 days money back guaranteed! 24 hours custmer support! If you have any problems, please feel free contact "Xaermall"! Thanks! If you have any questions about this product by ixaer, contact us by completing and submitting the form below. If you are looking for a specif part number, please include it with your message.